In the context of Apple’s annual revenue($156 bn), it is a tiny amount. In the context of its AppStore revenue (around $3 billion) it is more significant, but most importantly it is a reputational issue that Apple will want to address. This is a very good thing for the industry. Here are five reasons why. You will only get a refund if you did not give your AppStore password to your child. This is a clear, defensible rule that is unambiguous. Parents will need to learn (and Apple will need to emphasise) that giving someone your AppStore password is giving them access to the credit card tied to that account. If you don’t want to do that, don’t give your child the password. Mobile game design has, with some reason, been described as a Wild West. Developers are experimenting with new business models and Apple has intentionally stepped back to allow experimentation, learning and innovation. However, they also have a responsibility to help parents make informed decisions and developers to have flexible payment models that also protect minors from spending money that they did not intent to do. With the success of the class action law suit, senior executives will be more aware of the importance of tackling this issue head-on. 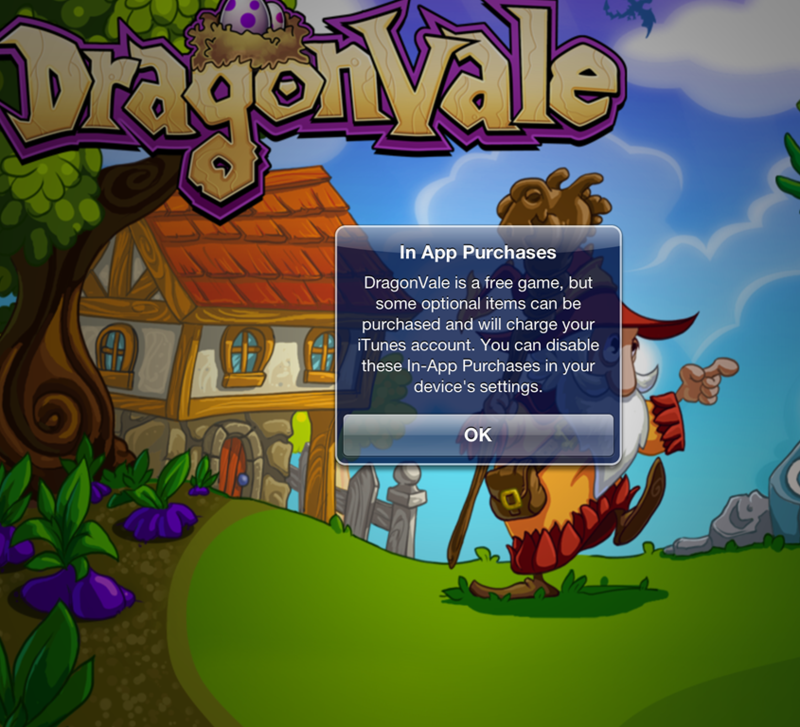 I believe that game developers should be allowed to charge very large sums of money for in-app purchases. We are moving away from the era of fixed-price businesses, where every customer pays the same amount irrespective of their desire for the product and the only way to drive more revenue is by increasing the volume. In the more nuanced world where a business’s raison d’etre is to find customers who love what they do and let them spend lots of money on things they truly value, variable pricing is very important. It should, however, be transparent and obvious. That means improved iTunes listings, perhaps a renaming of the Free+ price point and other ways of making it abundantly clear to anyone downloading the game that it contains micropayments. I hope that as a result of this class action, and points #2 and #3 above, Apple will have clearer guidelines for what constitutes appropriate IAP behaviour by developers. I would like to see no IAPs promoted during the first 15 minutes of play, particularly aimed at children. I would like all IAP transactions to be required to have a currency symbol. The GAMESbriefers have a list of ideas that Apple could implement to help with this issue. I believe that this class action lawsuit will focus Apple’s attention on this issue. (Personally, I really want a kid’s mode that is as easy to turn on as Airplane mode). 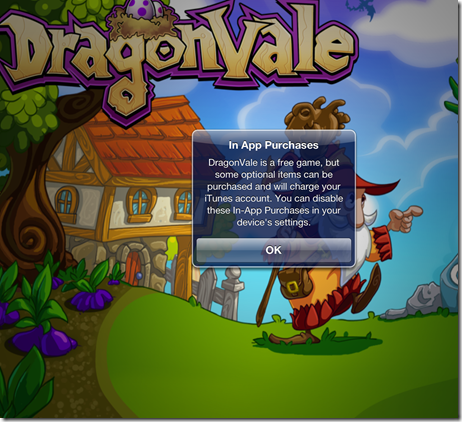 Backflip Studios, the developer of Dragonvale, a game which frequently occupies some of the top slots in the Top Grossing charts, puts this warning up as soon as you load the game. I think that reputable developers will get better at being open, honest and transparent about their In-App Purchase strategy, which will be good for us all. I’m pleased about the class action ruling because the alternative is much worse. I have argued before that four groups have responsibility for protecting minors: parents, developers, platform holders and governments. Most parents are responsible, but some aren’t. Most developers are responsible, but some aren’t. The risk is that if the platform holders don’t act, government will. That raises the spectre not only of regulation but of different regulation in dozens of countries the world over, a nightmare of logistics, lawyering and technological challenges which will remove many of the benefits of Apple’s global ecosystem. I see the class action suit acting in the way it is intended – as a check on the behaviour of large corporations. I hope that Apple (and Google, and anyone else with a global service that offers In-App Purchases) pays attention and adapts now. Because I would really hate for government to get involved.